Goodbye world. This is just too large to find what max-width really is. 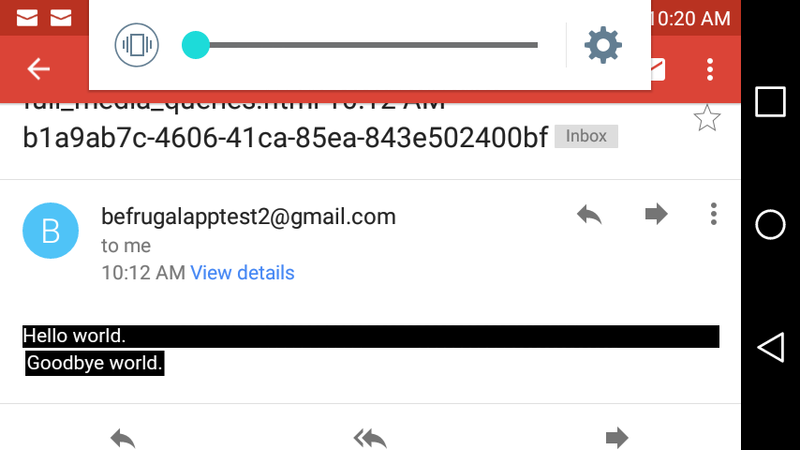 I'm leaning towards the latter, but wasn't it known that Gmail strips away the < head> tag in an HTML email? In your code you've set max width on a number of media queries. So on your mobile everything over the 350px query will be true, and because 2200px is the last one you include, that will override the others and display black background with white text. I thought the @media queries parameters are just conditions that I need to check. Are they actually "setting" the check to max-width of 2200px? Does that mean I need to reverse the order of all of the media queries, so that it is funneling down from the top? Multiple media queries can be true, in which case it'll read the CSS as it's stacked so priority is top to bottom, so yes reversing should fix it for you. I'm not sure why iPhones can't detect @media queries with screen and more than 1 conditions, but is able to detect @media queries with screen and 1 condition. I'll just go with reversing the @media queries.